Mickey Rourke is the surprise contender for this year’s Leading Actor award and he does a great job. Very few actors would have actually accepted to do the wrestling scenes leave alone pulling it off with such might. There is a sense of humbleness to his performance – A sense of dejection as if he continues to exist without living. Something like Hulk Hogan meets Bill Murray. The Wrestler follows (literally) the aging WWE champion Randy “The Ram” Robinson who is now almost washed up and his only tonic of life remains the cheers of the oblivious audience. He shuns responsibilities, hides under his wrestling name and fears life outside the arena. He stands in contrast to his love interest Cassidy, a stripper who does her work reluctantly and whose life begins only when she steps out of the club. Aronofsky’s direction is striking. We follow Randy like his manager, right behind him almost throughout the film (even during the fights) and suddenly we are made god as we detachedly observe Randy’s life from remarkable distance. As a result, we both empathize with Randy’s situation and mercilessly cheer at the massacre he is involved in. In essence, Aranofsky makes us guilty and hypocritical, never overtly demanding sympathy for its central protagonist. The wrestling matches move from fantastic to gruesome and then to shocking without any sign of artificiality. And that adds to the raw power of the film. The approach of the film is visibly fresh. But unfortunately, Aronofsky treads a tried and tested path. I mean, how many times have we seen the aging sports man, who is a loser in personal life too, coming back against all odds to pursue what he does best? As a result, the riveting performances and execution cower under a predictable script, hence making the film just good and not great. I found Wrestler a damn good film. The fact that Aronofsky chose to tread a tried and tested path, as you mentioned, makes his effort that much more creditable. He managed to make a genre movie, and yet not be engulfed by the cliches and formulae governing the genre. Consequently Randy as well as Cassidy as well-rounded characters – people of flesh and blood, and certainly more than the sum of their parts. 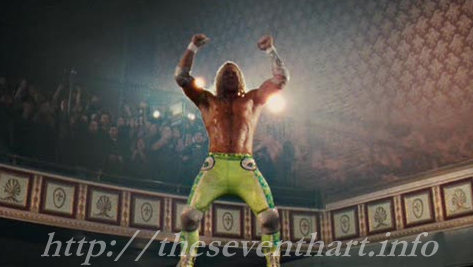 By the way, “Hulk Hogan meets Bill Murray” = nice line! How did you come up with that? H(S)ulk Hogan was natural. But Rourke reminded me of Murray from Broken Flowers, dunno why!